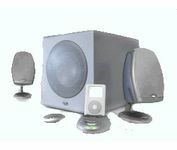 The iPod has reached a new level with this exciting audiophile quality speaker system from Klipsch. In tune with today's popular music-listening trends, Klipsch offers a high-performance speaker system designed exclusively for iPod owners and fans. A 2.1 Channel Stereo configuration comes equipped with two unobtrusive Klipsch Reference Series RSX-3 satellites, a Dedicated subwoofer, Docking station and RF remote control. The subwoofer, designed specifically for this system, has a built-in Class D amplifier that distributes 200 Watts of peak system power to successfully drive all the channels. It also features a slot port and line level input. A unique Tuning approach is used to achieve a Sound Character typically found in much larger subwoofers. Fills a room well enough to work as a low-budget primary sound system. Sound is surprisingly good for the price. Volume control on the satelite speaker is a bit strange. Klipsch did not send me an adaptor for the Nano, as advertised. However, my Nano works in the dock regardless, but is not very stable - worried about breaking the dock. I think they'll send me one if I write. If, like me, you've read all the reviews of the iFi you could find on the internet, you know well that nearly all are praising it's bass response and overall sound quality. I have been relatively spoiled by the $1400 B&W DM604s3 speakers in my home system and yet I can say that I find the iFi very nice sounding at a wide range of volume levels. (It initially sounded horrible until I discovered that it was shipped with the subwoofer turned to full volume and this results in a muddy sound indeed! I suspect that the individuals complaining about the sound quality have this same issue and it's a simple adjustment. [This or they hooked up the speaker wire incorrectly.]) The system has plenty of power to fill a large room and while not a steal at the MSRP of $400, is an amazing buy at the price most people are paying. I went with a "Direct from Klipsch" refurbished set purchased on ebay for $179. There is a dent in the subwoofer grill - likely the reason for the discount. It's a $220 dent I can live with and is purely cosmetic. A commonly cited complaint is the size/shape/button arrangement on the remote. Okay, it's not brilliant. Get over it. The good thing is that the remote works very well, even through walls. (And complaints about no menu options or access to playlists are absurd. Did Klipsch somehow lead these people to believe that they would have such features?) Another complaint I've read is that the speaker wires aren't permanently connected and must be set up by the user. This was no problem and should take just a few minutes to do and it allows the use of other (longer/shorter/better) speaker wire options in the future. Another complaint cited is the weight/unportability. Again I think this a case of unrealistic expectations and buyers being unaware of specifications of the system they are buying. Yes, it's heavy. It has to be to sound like it does. Lastly, some have complained about the volume control on the satelite. I agree with this one. It runs in reverse of my intuition and requires several good shoves to start achieving the results I want. Fortunately, I never find a need to use it, as the remote volume buttons are sensitive and work well. Overall, I, as most, am very pleased and can highly recommend the iFi. Quick response to my email question. B&W for home stereo and crummy computer speakers. Nothing actually similar to this. Simply AWESOME!! !BEST QUALITY AUDIO SYSTEM I have ever owned, hands down, and I am 61 years old, as of last week and originally from Boston area, land of KLH, Bose, Cambridge Sound Works, etc. etc. etc.. Purchased last week at Costco for only $199. Originally bought for the bedroom, now have 2nd set in living room with new HD LCD TV. Have assisted daughter and boyfriend getting a set, purchased a set to take to twin granddaughters in Seattle for their birthday 8-28, and will be selling my Bose 123 Theatre system (which cost me $1000) three years ago. Leaves Bose in the dust.